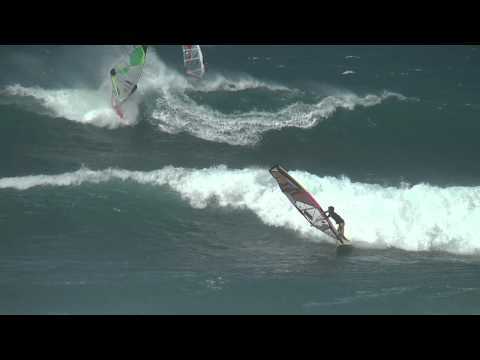 Windsurfing is a fun and spectacular extreme sport. Different styles of windsurfing require different types of gear. What if you could have a single sail to cover more than one windsurfing style? Naish team has thought at that when it has crafted the 2012 Moto sail. Moto is a new addition to the Naish sail range and it offers uncompromised all round performance. The Naish Moto can be used for wave, freestyle, freeride and even in light wind conditions. The sail features a moderate aspect ratio which makes it very dynamic and assures a smooth and fast glide. It uses a draft forward shape defined by a single scrim luff panel. This feature provides a consistent and constant power delivery and assures improved early planning potential. The Moto deliver solid, but balanced power. It also has improved jumping and lifting performance, so it can handle aerial tricks with ease. The great thing about the Moto is that it offers exceptional control in all situations. It can be handled with ease by any rider with decent skills. The sail can be easily powered up and used in light winds and it is reliable and accurate if the wind picks up. A five battens structure keeps the sail stable out on the waves. The Naish Moto is a solid sail which offers a good amount of power and high speed, as well as top control. It is available in four sizes and two distinct color schemes. It is guaranteed to improve the riding experience of all freestyle, freeride and wave riders out there.